Thank you to Mike Minton ’86 for participating in this Q&A. Why did you join the Delts as an undergraduate? My sister was dating an older Delt, and I had met several of his housemates. 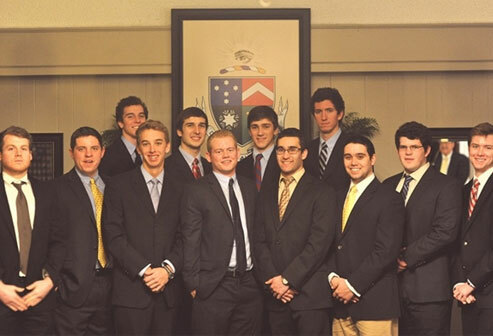 I also had several freshman dorm friends who were pledging Delt. What is the single fondest memory you have shared/will share with your children and grandchildren? I still tell my kids how Chuuuuuck had a special job at meal time – which was to yell for more MIIIILK when the pitcher was empty. How do you stay connected with your brothers as an alumnus? We still connect as a group occasionally. A bunch of us went to Homecoming as the 25-year alumni. We had to teach the current Delts some Euchre and how to play Mexican. What about your membership in Delt makes you the most proud? The exceptional men who were and are Delts from Miami. There are many way above average success stories for a group knuckleheads from the Midwest like our own. How would your life be different today if you had never joined the Delts? I seriously cannot imagine myself without that experience. It’s at the core of who I am. If you could go back and relive one moment from your Delt years, what would it be and why? I had lots of fun, and I did lots of stupid things – all are part of who I am now. Such as it is, I am proud of my accomplishments thus far. The only regrets I have are for the people I treated disrespectfully. There are more than a few of those from my Miami years – mostly they were “short-term girlfriends” and I owe a few apologies to that lovely bunch. Where has life taken you since graduation? What's new in your life today? I went on to get an MBA from the University of Chicago and pursued a career in IT consulting. I’ve been happily married for almost 20 years to a Hoosier from South Bend and we have three gorgeous, level-headed daughters. Nothing’s perfect, but I’m happy. Who do you stay connected with in your alumni years? Are there any brothers you've lost touch with whom you'd like to reconnect? Our class, and the couple classes plus/minus with whom we shared the shelter, stay pretty well connected. Everyone is tapped into the e-mail chain, thanks mostly to Chip. I wish there was better turn-out from the guys on that list who keep having excuses to not join us for the events. Why would you encourage other brothers to engage with Delt in their alumni years? There is a deep and meaningful connection among us, with the Delt house, and with Miami. It’s tremendously uplifting to get together occasionally and enjoy recalling those years. What is the best thing about your alumni experience? Without question, the thing I value most from my Miami Delt years is the group of exceptional people with whom I’ve been friends for decades.